In the society of dogs, the class system has historically been divided into pure breeds and mixed breeds. The “blue bloods”, or dogs of pedigree, were considered upper crust while dogs of undocumented heritage (mixed breed, mutts, and mongrels) were considered common. However, the canine class system, much like human hierarchy, has been altered overtime. Having a noble pure-bred birthright no longer always makes for a more desirable, prestigious, or expensive pet. What is a mixed breed? A mixed breed dog, as the name implies, has more than one breed in its bloodline. Most mixed breed dogs have unidentified parentage. In other words, there is no valid documentation of who their ancestors were, or how many different breeds contribute to their genetic make-up. A mutt is a mixture of many genetic traits and may have any combination of his ancestors’ characteristics. The potential for variety in appearance, conformation, and temperament is endless. A pure breed, especially one that is registered, has a definitive lineage derived from purposeful breeding to produce dogs with more consistent traits. Breed standards governing physical characteristics maintain the integrity of a breed that is registered with a recognized kennel club. What is a designer breed? Designer breeds combine the best of both worlds. Registered, pure dog breeds are “mixed” on purpose to create designer breeds. Intentional mixing of breeds optimizes the best characteristics of each parent. Sometimes the dog may have more than two pure breeds in his bloodline, but unlike a mutt, his lineage can be identified. Designer breeds are loosely referred to as hybrids, but this is not accurate terminology. True hybrids are created when breeding occurs between different species. The offspring produced by mixing two bloodlines within a species, i.e. canine, should be more accurately referred to as crossbreeds. In short, a mixed breed dog or mutt is one of undocumented parentage, while a crossbreed or designer dog has identifiable parents of two validated breeds. breeding to be considered a 'breed' "
For a designer breed to become recognized as a “new” breed, an established kennel club has to review the documented ancestry of the breed all the way back to the original parents. When the kennel club is satisfied with the breed’s history and pedigree, they may designate the new breed and register it as such. This registration elevates the status of the designer breed. How are designer breeds “designed”? Simply breeding a Standard Poodle to a Golden Retriever producing a first generation of mixed pups does not qualify the litter as a recognized new breed. Creating a new breed requires careful, purposeful breeding. 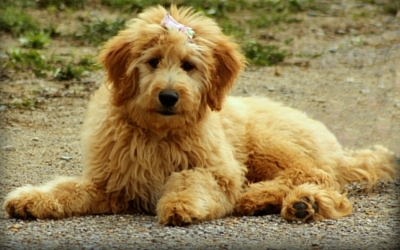 It took a while to create the new breed of dog called “Golden Doodle”. Here’s a little review of genetics using the Golden Doodle as an example. The first generation of mixed pups is called an F1cross and is a 50-50 mix of Standard Poodle and Golden Retriever. When two crossbreds are bred, this is termed an F2 cross. When two F2 dogs are bred, their offspring are termed F3 cross. F3 crosses are called “multi-generational” crosses. It takes three generations of documented breeding to be considered a “breed” (in this case, Golden Doodle) rather than a “crossbreed” of Standard Poodle and Golden Retriever. In other words, the registered name, Golden Doodle, must be earned over time. Pros: Careful breeding may produce pups that have the best qualities of both parents. Standard Poodles don’t shed much—a desirable trait.. Golden Retrievers have a calm disposition and physical endurance—other desirable traits. Put the two together and you have a very desirable pup. Genetics are often enhanced by crossbreeding, as the pups may exhibit greater heartiness or hybrid vigor. Inbreeding tends to amplify weaker traits, while crossbreeding may help avoid certain undesirable recessive traits by adding strength to the gene pool. In other words, recessive genes may not be expressed as often when mixing breeds. For example, the offspring of a Standard Poodle and a Labrador Retriever, a Labradoodle, may not have the degree of hip dysplasia noted in many pure Labrador bloodlines. Gene pools can be fickle, and although the results of designer breeding may not be as predictable as desired, they are still more predictable than the characteristics of mixed breeding without intent. Cons: The combination of breeds may not produce results as consistent as those obtained when mating pure breeds. Many potential pet owners seek dogs that don’t shed profusely. When mixing a Standard Poodle with a Golden Retriever, if a pup’s coat predominately reflects the heritage of a Golden Retriever, the daily vacuum may be needed after all. And recessive traits, although diluted, are still possible with cross breeds especially in F2 or F3 generations. So, Labradoodle pups may still have poor hips. Cockapoo: cross of Poodle (usually not Standard) and Cocker Spaniel. This breed has been around a long time and is considered to be one of the original designer breeds. Malti-poo: cross of Maltese and Poodle (again, smaller variety of Poodle). Peke-a-poo: another successful breeding of small Poodle and Pekingese produces pups with longer noses and fewer respiratory problems. Labradoodle: cross of Standard Poodle and Labrador produces a smart, athletic, larger dog. Goldendoodle: this Golden Retriever and Poodle combination results in friendly, loyal pets. Goldador: leave out the Poodle and mix Golden Retriever with Labrador for an athletic, loyal companion that sheds. Maltese-Shih Tzu: one of the few designer dogs that doesn’t have poodle parents or a cutesy name. Puggle: Beagle and Pug parents produce cute, fun pups of reasonable size that don’t have as many respiratory issues as pure bred Pugs. Schnoodle: this cross between Miniature Poodle and Miniature Schnauzer is energetic but loves to snuggle. Yorkipoo: Miniature Poodle bred with Yorkshire Terrier creates a small dog with a big personality. As you can see, there are many possible combinations of crossbred dogs. So, don’t be intimidated by canine blue bloods. Mixed breeds and crossbreeds can produce wonderful dogs with sought-after traits that make great family pets.